A lot of people intellectually understand how the think-feel-act cycle works: change your thoughts, feel new feelings, act differently. But the piece that a lot of those same people get stuck on is waiting to feel “good” to actually start acting differently in terms of their drinking. And that’s where dares comes in. Daring yourself, moving towards discomfort, teaching your brain that you can handle whatever comes your way is how you will learn to change the habit of drinking. 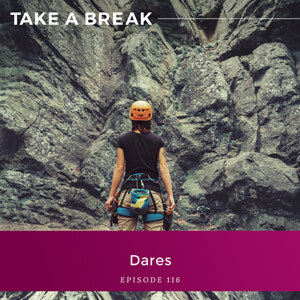 Join me today as I break down why we stop daring ourselves and pushing the limits of what we think is possible after childhood and how you can start adding dares back into your life. You’ll learn the number one question you need to answer to figure out what you need to start doing – over and over again – to finally disprove your brain! A common misconception of how to use the think-feel-act cycle and why many people get stuck. Why you MUST learn to embrace negative emotion in order to make lasting changes. How dares work on your brain. Why we stop daring ourselves after childhood is over. The antidote to fear and anxiety. How challenging yourself empowers you rather than alcohol. The question you need to answer to discover what daring action you need to start taking! 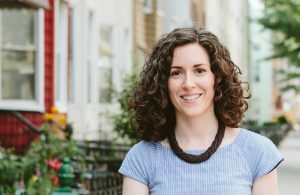 You are listening to the Take A Break podcast with Rachel Hart, episode 116. Right everybody, we are talking about dares today. This is one of my all-time favorite topics and I’ll tell you had you met me – I don’t know, 10 years ago, you would not have thought to yourself, “Oh, that woman Rachel, she really loves to dare herself.” You would have thought the exact opposite. I hated daring myself. I wanted to avoid being uncomfortable at all costs, and in fact, I did that for a really long time. But you know what? It got me nowhere because daring yourself, moving towards discomfort, teaching your brain that you can handle whatever comes your way is how I learned how to change the habit of drinking and how you will learn to change the habit of drinking. You cannot just do it by sitting in your chair right now and listening to a podcast. You have to be willing to dare yourself. And this is one of the areas where I see a lot of people get stuck when they learn about the think-feel-act cycle. So they learn this framework about why they feel the way they do, why they’re drinking, why they’re saying yes to a drink. They start to understand, oh my gosh, my feelings and my actions aren’t just these mysterious things that come out of the clear blue sky. They are connected to what is running through my brain. They are connected to my thoughts. All the sentences in my head. My thoughts create my feelings and my feelings drive my actions, and those actions give me my results in life. And I will tell you, as someone who was so immensely excited to finally discover a framework for something that for so long in my life had felt so mysterious, it is a really exciting moment. But where you can so easily get stuck is if you sit back and think okay, well if my thoughts create my feelings and I’m pouring a drink in order to change how I feel, well, then all I need to do is find the new thought. All I need to do is think the thought so I won’t experience a negative emotion. And so we want to do this work intellectually. We want to sit back and do it in our head and just find the different thoughts for us to think, but here’s the problem – and there’s a problem – we’re human. You and I and everybody else, we are human beings and human beings, we’re designed, we were built to experience the entire spectrum of human emotion. Not just the good ones. Not just the positive, pretty, happy ones. Unless you learn that you don’t have to run from negative emotions, you will always be looking to change them. You will always be looking for some sort of relief from something that you don’t need relief from. We don’t need relief from something that we were designed to experience. And that’s how a lot of people will get stuck using the think-feel-act cycle. They’ll tell themselves, “I’ll just wait until I feel better. I’ll just wait to do something until I feel better. I’ll just wait to say no to a drink until I feel confident enough. I’ll just wait to go to that party and drink seltzer until I don’t feel insecure.” You’re going to be waiting for a very long time because you are waiting for the impossible to come. You are waiting for that day when you never experience negative emotion. If you want to change your drinking, if you want to change the habit, if you want to stop overdrinking, it means that you are embracing negative emotion, that negative emotion becomes something that is totally tolerable, something that you can handle 100% on your own. It doesn’t matter what’s inside your glass. And someone said to me recently, she said, “I set my dare but I’m not happy about it,” which was so perfect because I said to her, “You’re not supposed to be happy about it. If you were happy about it, it wouldn’t be a dare.” It wouldn’t be you meeting discomfort. It wouldn’t be something that your brain is currently telling you that you’re not capable of because a dare is a challenge to yourself. You are challenging yourself to do something that right now your brain says I’m not sure that you can do it. Or maybe you believe I can do it but I don’t want to. Those two distinctions are really important. Sometimes we’ll tell ourselves, I know I can do it, I know I can not drink at that party, I know I can not drink tonight, I just don’t want to. But listen, that in and of itself is a dare. It is a challenge to yourself to feel the negative emotion that you don’t want to experience. When was the last time that you can think of that you dared yourself to do something? Was it a week ago? A month ago? Six months ago? A year ago? And how often do you do it? How often do you proactively dare yourself to do something that feels kind of barfy? Feels like you’d rather just crawl under your bed and hide. We used to do it all the time as kids. In fact, I think about this a lot because I spent my summers at sleep away camp. I would go to Girl Scouts camp in the summer and I really look back at that time and I think about how I would spend my summers daring myself over and over and over again, with all different sorts of things. That’s what I was doing as a kid. And it’s not like I didn’t have fear. I definitely did have fear, but I moved through the world kind of chasing after discomfort. And it’s interesting to think about why don’t we do it anymore? Why is it something that a lot of us can think back to a time when we were kids, where we were daring ourselves and doing it on the regular? Why were we willing to swing really high and jump off the swing? I remember doing that as a kid all the time. I have nightmares thinking about when my child is old enough to do that, but I remember doing that all the time. Why don’t we do it anymore? The reason is because we have created a story in our brain about what failure means. Because here’s the thing; daring yourself does not mean that you are always going to succeed. If you really choose something that is truly challenging, that is truly outside of your comfort zone, you don’t have 100% guaranteed success. You may fail. But as soon as we have a story about what that failure means about who we are as a person, guess what, we want to try to avoid failure at all costs. I want you to think about this. Failure, any and all failure is just a circumstance. It is neutral. I don’t care what the failure is. No matter what, it does not create an emotion for you until you think a thought about it. And just spend a second right now thinking about how you view failure. Is it acceptable? Is it okay? Is it something that you are willing to move towards? Are you willing to fail on purpose? Or is it something that you try to avoid in all sorts of areas of your life at any expense? As soon as failure becomes a story about who you are as a person, you will do everything to avoid it. Because of course, we don’t want to believe that there is something wrong with us, and so we try to do it all perfectly. And in that chase to do it all perfectly, we stop daring ourselves. We stop challenging ourselves. We stop doing the things that make us uncomfortable because god forbid, what would happen if we don’t succeed. But here’s what I want you to know; the antidote to fear and anxiety is simply belief in yourself. It’s not learning how not to be afraid. It’s learning that even though you are afraid, you believe that you will be able to see yourself through. It is belief in yourself that is the antidote to fear and anxiety. I still have fear. I have fear all the time. But the more that I challenge myself to do things that are uncomfortable, the more I believe that I am capable of what my brain wants to tell me is not possible. Let me tell you, when I was in the habit of drinking, when my evenings and weekends were all about giving my brain a reward and blowing off steam by pouring myself a drink, I will tell you this; I didn’t have a lot of belief in myself. I had a lot of belief in the drink. I had a lot of belief in the power of alcohol to turn me into fun Rachel. That’s what I thought alcohol did for me. I thought that there was boring Rachel and fun Rachel, and the only way to get to fun Rachel was for me to have a couple drinks. That’s what I had belief in. I didn’t understand it at the time. I didn’t understand that I had put all of my belief into the contents of my glass, but that’s what I did. I didn’t know how to deal with my stress or anxiety or my hang ups, my insecurity, my awkwardness. I didn’t know how to deal with my loneliness or my boredom, but I had belief that a drink would help me do it. Now, of course, it temporarily made me believe that I was having a good time and it temporarily made me feel confident, ad it temporarily entertained me and made me feel more connected, but guess what happened and guess what always happens. It always wears off. And the more I reached for it, the more dependent I became on it. The more I told myself no, the only way that you can enjoy yourself is if you have a drink. The only way that you’ll have a good time at this party is if you drink. The only way you will get through this first date is if you drink. The only way that you’ll be able to deal with the stress that you are feeling is to go home and pour yourself a drink. I had so much belief in alcohol and so little belief in myself. But here’s the thing; when I decided that I was finally going to go about changing this habit in a different way because I had quit so many times, I had woken up so many times before and told myself never again, you’re never going to do that again, I swear. And then of course, what would happen? I would go back to drinking. When I really committed to the idea that this wasn’t just going to be about saying no to a drink, that I was going to say no in order to learn that I could handle any emotion, when I did that, all of a sudden, I was forced to dare myself all the time. Because you know what, if you want to learn how to handle any emotion, you can’t sit in your studio apartment in New York City and hide out. That’s a very good way to count days and cross days off a calendar. It’s not a good way to change the habit. And the more that I would dare myself, the more that I would go to the events and hang out with my friends and go out on dates. The more that I would experience the world in ways in which I told myself would never be fun, never be enjoyable without a drink, the more I discovered I was so much more capable than my brain was telling me. My brain wanted to scream at me all the time, you can’t do it, you can’t do it, you can’t do it. And you know what, I just believed it. I just believed that I really couldn’t do it because I couldn’t understand how the brain worked. I didn’t understand how the brain evolved. The brain evolved to help humans learn how to survive in a dangerous world. It wanted for me to be safe. It was always looking to avoid discomfort. But here I was living in a modern world. My survival was really not at stake. But that lower brain still had the same framework going. It had that same programming running. Find pleasure, avoid pain, do so efficiently. So of course, it was telling me all the time you can’t do it because when I would step up to the plate, when I would go after something that made me feel uncomfortable, where I had a lot of fear and anxiety, my brain was like let’s avoid this, let’s not feel the fear and anxiety, that’s going to help with survival. But of course, it did the opposite. It made my life less. It deadened my experience of life. I had to stop believing the thought you can’t do it. I had to understand that that was just a part of my brain that did not know where we were. It thought that we were on the Savannah and I was going to be chased by lions. It didn’t understand you’re just going to a cocktail party, you will not get eaten alive there. You have to stop believing that the thought I don’t want to is a good enough reason to stay small, is a good enough reason to hide out, is a good enough reason for you to stay stuck in this habit that is not serving you. I want you to think about this. What is the most daunting part right now for you when it comes to taking a break, when it comes to not drinking? What is it? Is it not having drinks with certain people, certain friends, maybe your partner? Is it not drinking in certain situations or certain settings, a certain time of day? When you feel a certain emotion? What is the most daunting part of taking a break? Really answer that question for yourself. And when you have your answer, you got to go out and do it on purpose again and again and again. And here’s when I know when I’ve hit on it either with myself or with my clients, when we really identify that thing that is holding them back. Because when I say okay, this is your work, this is what you got to go out and do, this is the work to disprove your brain, I get that kind of, I don’t know how to describe it other than a barfy expression on someone’s face. When they look sick and they almost kind of stick their tongue out. You know that noise, don’t want to do it. This happens for me too as well. That is your body recognizing oh my god, we’re actually going to move towards discomfort. But that really is how you start to retrain your brain. People want to ask me all the time, how long is it going to take me to change my desire, Rachel? When will it be that I stop desiring alcohol so much? Well, how willing are you to dare yourself to do the things that feel very daunting? How willing are you to put yourself in the way of discomfort? Someone said to me recently, she said, “It sounds like when you were doing this work, you were daring yourself all the time,” and I never really thought about it that way when I was doing it at first but that is indeed what I was doing. I was daring myself all the time. I was not hiding out in my studio apartment hoping that magically, things would change when I was in isolation. I was going out and meeting the world without a drink in my hand, which made me want to barf, was so uncomfortable. I was you to think about it. Listen, if the thing right now that is standing in the way for you is date night with your husband, let’s just say that’s what it is, imagine how you would be different if you committed to going on 30 date nights with your husband where he was drinking and you weren’t? Imagine how different that would be for you. Imagine if you did 30 dates in 30 days. I’m just thinking about that right now for a second. I was like, my husband and I would definitely not be able to do 30 dates in 30 days so that may not be so reasonable, but imagine if you just committed to 30 of them. Imagine what would happen. Imagine how different you would be after 30 of those dares. The woman who started out would not be the woman after even just one or two or five, or 10 or 15 because here’s what happens; every time you start to prove to your brain oh, I am more capable, things are not as bad as you are envisioning, this is you just catastrophizing again. And here’s the other thing, I’m not saying that you’re going to immediately enjoy it. I’m not saying that it wouldn’t still be uncomfortable, but you would have the map to figure out how to have a good time without a drink because you would have all the thoughts. You would be able to identify all of your thinking, and that you would be able to work on. That you would be able to question and challenge and change. If you want to change the habit of drinking, you have got to be willing to look at the areas where you just think, “I can’t do it, it’s too hard, it will be too uncomfortable,” and you have to be willing to move towards them. But here is the best part of it. This will change everything for you. Learning that I can’t do it is a lie and I don’t want to is a really terrible reason, learning that your brain is constantly underestimating you, not because it doesn’t believe in you but because it thinks that avoiding discomfort is important for survival, learning how your mind works, what you are thinking when you go into the situation, when you’re with the person or you’re experiencing the emotion or you’re at the event and you’re not drinking, learning how your mind works, this is how you gather the data and collect the evidence to actually change your drinking. And this is why the work that I teach is not about crossing days off a calendar. People do that and they hide out. And listen, I get it because sometimes the habit has been going on for so long that taking a 30-day break does feel kind of tremendous. But unless your life is going to be one in isolation, you’re going to have to figure out how to do this around other people. And unless your life is going to be one which you never experience negative emotion, which P.S. it’s impossible, you’re going to have to learn how to not drink and have a negative emotion. But learning this skill with changing the habit, it will change everything for you because you can apply it to anything and everything in your life. It’s not just around not drinking that we don’t want to dare ourselves, we don’t want to challenge ourselves. It’s around so many, many parts of our life. How we show up at work, how we show up with our partner, what we go after, what we apply for, the goals that we set for ourselves. Dares are a fundamental skill in having a life that is amazing. I want you to think about today. When was the last time that you dared yourself? How willing are you to challenge yourself and to move towards discomfort? And who would you be if this became the foundation of your work instead of just focusing on saying no to a drink, you focused on doing the things that your brain is telling you is impossible? You would be a radically different person. This is exactly what happened for me. Daring yourself is the path. It will change everything. And if you want to know how long it will take for you to change your desire, all you have to do is look at your willingness to say no and your willingness to be uncomfortable. You just have to create new evidence for your brain. Alright everybody. Go dare yourself today. See you next week.